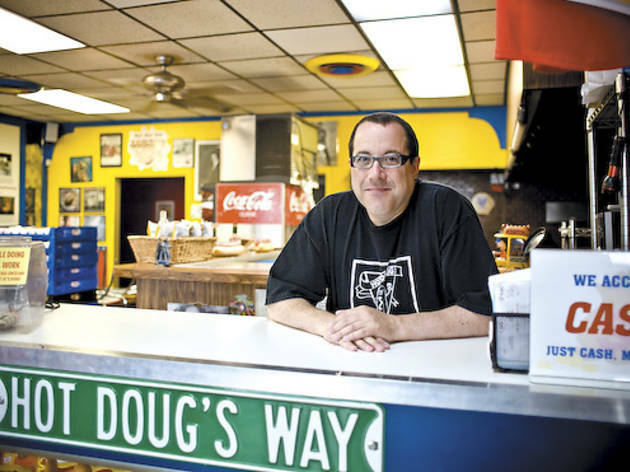 Greasy bags of fries and divey dog stands were big influences on Hot Doug’s owner. When then-12-year-old Sohn and his mother moved from Deerfield to a Gold Coast high-rise in 1973, the future owner of Hot Doug’s(3324 N California Ave, 773-279-9550) found downtown Chicago to be the perfect playground. The Latin School graduate, 49, went on to open his wildly popular “encased meat emporium” in 2001, known as much for its perpetual crowds lined up outside as its haute takes on hot dogs. Did you come out of high school on a path toward the culinary world? Not even close. Growing up, I don’t even recall ever having fresh vegetables. On Sunday nights we ordered Chinese like all good Jews should. Part of it was Chicago didn’t have the diversity in restaurants that it has now. Molecular gastronomy was the spinning salad bowl at the Blackhawk [restaurant]. Which hot-dog stands do you remember? One place, Five Faces [Ice Cream Shop], is still on Division Street. The other was called Tony’s; it was on Broadway. I remember you’d get the miniature brown grocery sack filled with fries and it’d be just soaked in grease. And the fries were great. 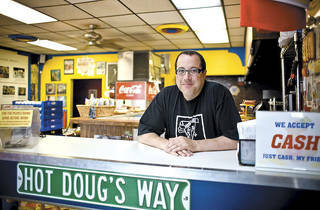 How have those memories informed what you do at Hot Doug’s? I think a lot…. When people refer to us as this gourmet place, I kind of dispute that. The crux of the place is the stuff on the walls. The colors. The menu. The impetus was…much more a throwback to a big bag of fries and a good Chicago hot dog in this fun, kinda divey atmosphere.